The Club is set to participate in the Lenexa Community Days Parade again this year. This year’s theme is “Lenexa Through the Decades” again. Parking and meeting location is at the VFW Post 7397 at 9550 Pflumm Rd. Lenexa, KS. Contact Jay Pruett at 913-302-1273 for additional details on the Lenexa parade. We’re excited to see you at the Lenexa Community Days Parade on July 4. Here are important details regarding the lineup and staging. Please be sure to share this information with all of the members of your entry. Line-up Time – Parade entries can line up starting at 9 a.m. Be sure to give yourself plenty of time to navigate the road closures and enter the parade lineup on time (this year’s parade is one of the largest we’ve had, so it may take longer for entries to get in and situated, especially any entries that arrive at the last minute). All entries must be in place by 9:45 a.m. The parade begins at 10 a.m.
ahead of time so you will be prepared that morning. All vehicles in the parade must enter the staging area by taking Pflumm Road (south of 95 th Street) to 96 th Terr. This is the only entrance for vehicles driving in the parade. Staff will be there to direct you to Widmer Street for check-in. You will then be directed into the parade staging area on 95 th Street and Santa Fe Trail Drive. People walking in to join an entry may do so by walking in from several different intersections, including 95 th Street & Pflumm or 95 th Street and Santa Fe Trail Drive. Some entries will line up on 95 th Street between Pflumm and Santa Fe Trail Drive, and other entries will line up on Santa Fe Trail Drive between 95 th and Park streets. Entry numbers are marked on the street. Everyone associated with your entry should plan to meet at your entry number in the staging area and be ready to go when the parade begins. Please check the Parade Lineup listing (see attached; we’ll also post it on the city website) for the location of your entry. Parade staff will be located throughout the staging area to help direct you to your line-up position. Entry number (# 71 - GKCTCC is the last entry in the parade). I will send each parade registrant his/her entry number in a separate email by the end of this week. It is important that you print out the entry number, and place it on the left side of your entry. Parade route. 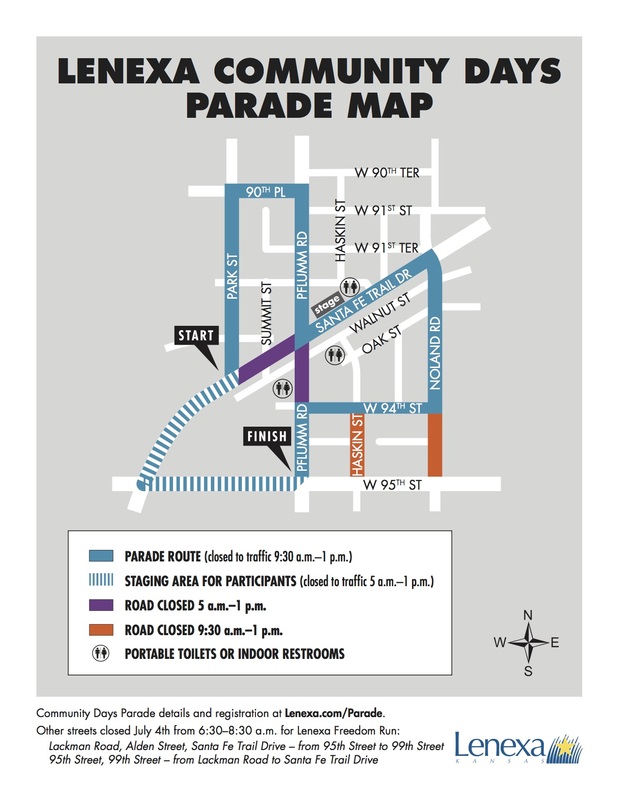 Please view the parade route on the city website (https://www.lenexa.com/government/departments___divisions/parks___recreation/festivals_events/community_days_parade). The parade end has changed from previous years. Instead of ending at 95 th and Noland, the route now turns west onto 94 th Street from Noland, then south on Pflumm to 95 th Street. Entries should disperse on 95 th Street. Be sure to invite family and friends to line the streets on the route to watch the fun. Parade rules. Please have your entry participants review the parade rules on the city’s website . We want to be sure everyone has a fun time and that they stay safe! In particular, please note that candy and other give-aways cannot be tossed out of vehicles. If you wish to give away candy or other items, you must walk along the curb and hand the items to people. Also, your entry shouldn’t travel at speeds of more than 5 MPH (and stay approximately 30 feet behind the entry in front of you). Be sure that your entry does not stop or otherwise hold up the parade, though. We want to avoid gaps in the parade. Parade theme. 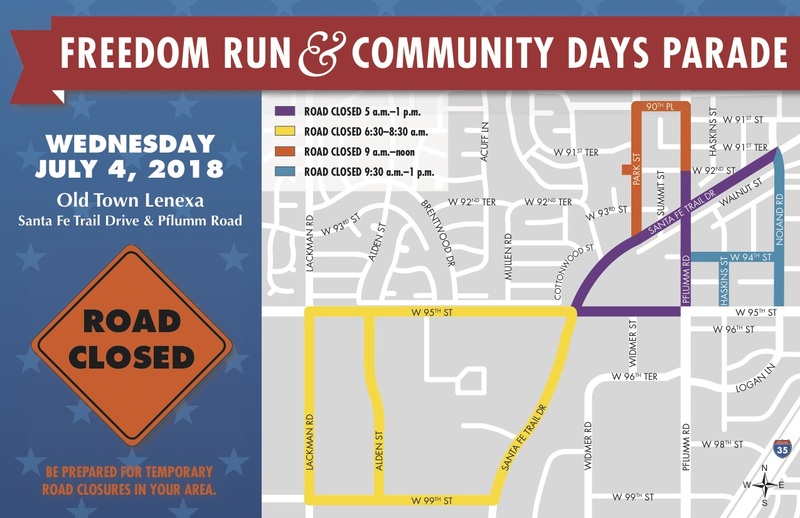 The theme for this year’s parade is “Lenexa through the Decades.” The Lenexa Parks and Recreation Board feels that parades are primarily for children, and requests that entries reflect a child- and family-friendly experience. Please keep this in mind when planning the topic for your entry. Length of parade. The parade route is approximately 2.25 miles (depending on where you are located in the lineup). The parade typically lasts 1.5-2 hours depending on the number of entries. We look forward to seeing you on July 4. Please let me know if you have any questions. If you need to reach me the morning of the parade, please call my cell at 913.369.5143.